In these notes we study the basic theory of ordinary differential equations, with emphasis on initial value problems, together with some modelling aspects. The following topics are treated: 1. Models and Explicit Solutions, 2. Existence and Uniqueness, 3. Linear Systems, 4. Stability and Linearization, 5. Some Models in two and three dimensions, 6. Quantitative Stability Estimates, 7. Boundary Value Problem. Hundsdorfer, W. (2014). 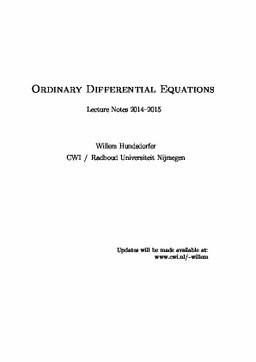 Ordinary Differential Equations -- Lecture Notes 2014-2015. Multiscale Dynamics [MD]. CWI.